Even taking on a side bottom of League 1 with eight consecutive defeats couldn’t reverse Dons’ fortunes as they slumped to a miserable defeat to Chesterfield on Tuesday night. Despite peppering the Spireites’ goal with 15 attempts in the opening half, Richie Barker’s squad went in trailing at the break, as Jay O’Shea smashed home a penalty against the run of play. 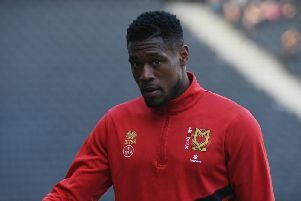 Kieran Agard twice shot wide before hitting the post and headed narrowly wide before he was taken off for Ryan Colclough on the hour. Failing to really test keeper Ryan Fulton, it wasn’t until the 67th minute that Dons were given a lifeline. The enigmatic Daniel Powell was proving a handful for Chesterfield, but despite a heavy touch when through on goal, the ball bounced back off the keeper and into his path to bundle in the equaliser. From there, Dons sensed blood in the water against Danny Wilson’s men, who came into the game equally nervous and shaky when under pressure. So when the ball fell to Colclough on the edge of the box just six minutes after Powell’s equaliser, it was no surprise to see it deflect past Fulton to give Dons the lead. It looked like there was only one side to win it, but such has been the way at Stadium MK, that team would be Chesterfield. First, Kristian Dennis was given the freedom of the penalty area as Dons’ defence stopped, expecting a flag, to rifle home an equalise with 13 minutes to go. And three minutes later, fellow substitute Dan Gardner tapped home Gboly Ariyibi’s cross to secure Chesterfield’s first win since September, extending Dons’ miserable home record.